Treat Mum this Mother’s Day with a harbourside high tea at Ramada Hotel Hope Harbour, Gold Coast. Enjoy picturesque views and live music from popular duo Who’s Charlie while sampling the sumptuous high tea buffet selection, which includes a range of finger sandwiches, hot options and sweet treats. Tucked away on the tranquil waterways of Hope Island, Ramada Hotel Hope Harbour hosts regular events for visitors and Gold Coast locals, including live music on Fridays and Sundays. 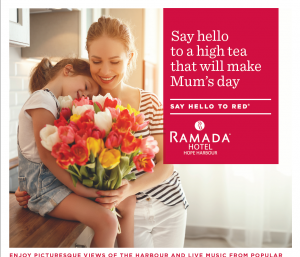 Ramada Hotel Hope Harbour’s Mother’s Day High Tea kicks off at 12 noon on May 13 and is $38 for adults and $19 for children aged five to 12. Kids aged four and under are free. Seats are filling fast. To book, call 5530 9111.